My sister Raana made this film on the theme of community – helped by her brilliant support worker Indra – for sharing at this week’s (Un)Ordinary Conference in London. The event, held by the campaigning learning disability charity Stay Up Late, was billed as “a learning disabilities conference with a difference” because professionals from the social care sector made up much of the audience and those on the platform had a learning disability and/or autism. The event explored learning disabled people’s views on community, relationships and employment. I’ll write about my own thoughts later, but right now I don’t want to put my own filter on what Raana wanted to share – not least because if I did, that filter would spontaneously combust into a zillion radiant pieces of joy. I am so incredibly proud of my creative, determined sister, a fact that will be obvious to those who’ve supported and been following the progress of the book Raana’s inspired, Made Possible. What I will add though, for context, is that Raana has fragile x syndrome and in the past she’s found it tricky to do some of the things she does now. And while she’s done public speaking in familiar places with friends and her trusted support staff, it was a huge deal for her to travel up to London for the day and be in a place she’d never been to before with a whole new bunch of people she’d never met. Raana didn’t fancy making a speech or taking questions, hence the film with captions. We hope it makes you smile. 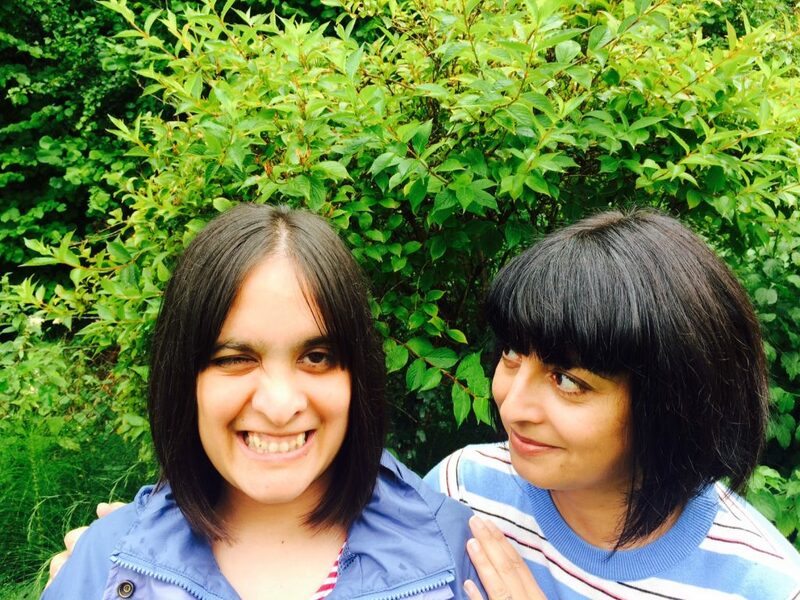 With my sister Raana (left), who has fragile X syndrome and who has influenced my book Made Possible. Just over a year ago I launched the crowdfunding campaign for Made Possible – and now I’m delighted to say that I’ve just delivered the manuscript to the publisher, Unbound. 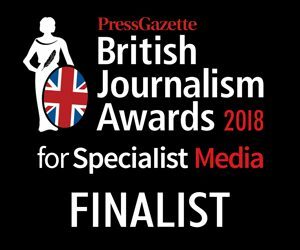 And I know I’ve mentioned this before, but I can’t stress it enough – I’m hugely grateful to everyone who has backed Made Possible, or who has shared news about its progress to ensure it gets made. It still amazes me to think that this project – a collection of essays on success by people with learning disabilities – was fully funded within just six weeks. The speed with which the book hit its funding target proves how much this stereotype-shattering title is needed. There are 1.5m people with learning disabilities in the UK today but people with learning disabilities aren’t asked to talk about their talent, or share the secret of their success – that’s why I wanted to create this book. Society barely gives them lip service; they are pitied or patronsised, and rarely heard from in their own words. Now that the manuscript’s done, I’ll be working with Unbound’s editorial team over the coming months and I’m looking forward to seeing the title take shape. People with learning disabilities face huge inequalities in everything from healthcare to education and employment (not to mention barbaric treatment, locked away in ‘care’ institutions, as reflected in recent media coverage). This book of powerful and entertaining essays by learning disabled high achievers will show an alternative approach to treating and supporting people, and the benefits of that approach. You can find out more about the book in this Guardian piece. 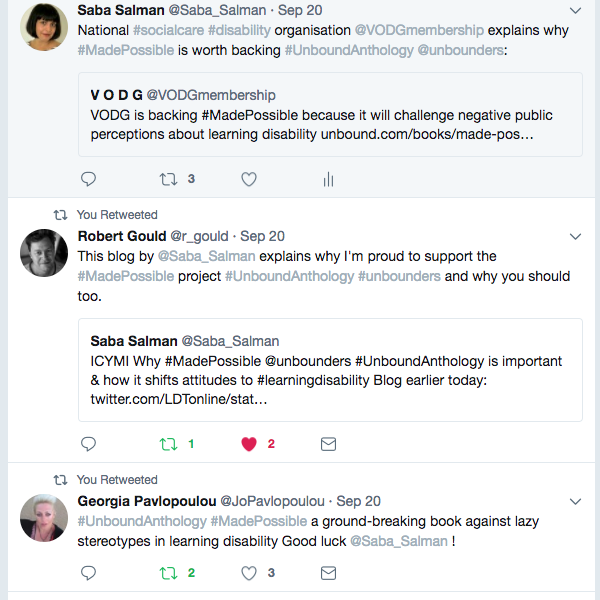 There has been surge of support for Made Possible, the non-fiction book challenging learning disability stereotypes I’m crowdfunding with the award-winning publisher Unbound. The crowdfunding campaign has been so popular that the anthology is more than halfway to being published – just three weeks after launch. Wow (the background to the book is in this previous post). I’m so grateful to everyone who’s pre-ordering Made Possible (all supporters get their name printed in the book), as well as sharing its aims and inviting others to get involved. 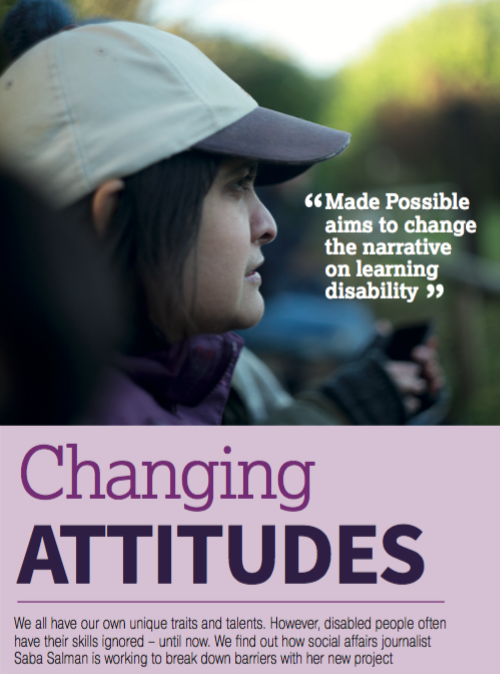 As I write this update, there are 127 people in our Made Possible community, and I’m absolutely delighted that the book’s incredible range of supporters includes learning disability self-advocates, family members, campaigners, professionals, support organisations and people interested in human rights. If you’re on social media, do follow #MadePossible and connect on Twitter, Facebook, LinkedIn or Instagram – I’d welcome the chance to hear from you if you fancy saying hello. Thanks so much to everyone for joining the growing campaign to publish this book; I’m looking forward to seeing what the next week brings.